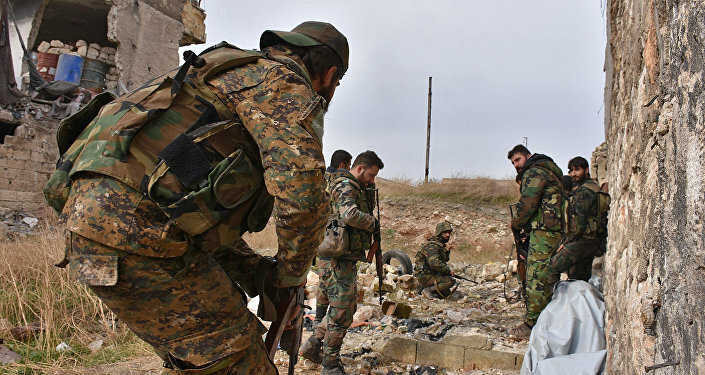 Kurdish People's Protection Units (YPG) gained the upper hand in armed clashes with jihadists and have taken control of several districts in Aleppo. In an interview with Sputnik Arabic, representative of the Revolutionary Army, which is also a part of pro-government Syrian Democratic Forces (DSS), Zekeriya Abdulmajid said that Kurdish self-defense forces are quite successful in fighting against jihadist groups in Aleppo. "The YPG fighters and the Revolutionary Army as part of the DSS are involved in clashes with jihadists and are actively moving forward toward the center of Aleppo. We released several positions from the terrorists. In the east of Aleppo our forces managed to take control of six districts," the serviceman told Sputnik. According to Abdulmajid, Ahrar al-Sham and al-Nusra Front terrorists repeatedly attacked local armed forces with heavy weapons in order to regain control of the territory. "We responded with a strong resistance, forcing the jihadists, who suffered substantial losses, to retreat. Our forces also trying to support the civilians trapped in the zone of combat operations and, among other things, provide them with food," Abdulmajid. The serviceman also noted that demining teams are continuing their work on neutralizing explosive devices hidden by terrorists in the area. He also stressed that civilians continue to flee from the fighting in safer regions. Earlier, it was reported that intolerable living conditions due to the presence of the militants have forced the residents of Aleppo to escape from the territories controlled by terrorists as soon as they get a chance. Over the recent months, Aleppo has been a major battleground in Syria, engaging government forces, jihadists, and numerous opposition groups. Eastern Aleppo is currently encircled by government forces, and the fighting has affected thousands of civilians still trapped in the city.